A rendering of the Golisano Institute for Sustainability. 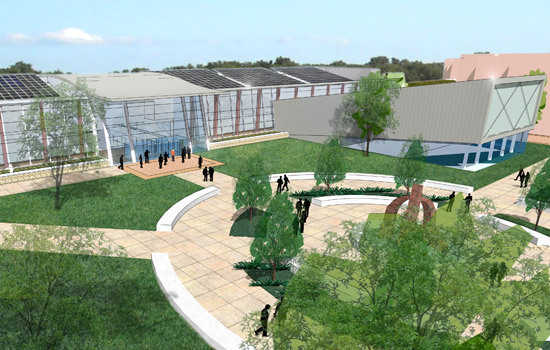 Rochester Institute of Technology has been awarded a $13.1 million grant from the National Institute of Standards and Technology to assist in construction of a new green facility that will house the university’s Golisano Institute for Sustainability. The building will serve as a center for sustainability research, technology transfer, education and outreach and provide a state-of-the-art showcase for green construction and design. The Golisano Institute was formed in 2007 thanks to a $10 million gift from Paychex founder and chairman Thomas Golisano, an RIT trustee. The institute currently houses one of the world’s first Ph.D. programs in sustainable production and is developing master’s degrees in sustainable systems and sustainable architecture. The institute also conducts cutting-edge research in nanotechnology, alternative energy development and validation, sustainable design and pollution prevention and works with a host of businesses and state and federal agencies including Xerox Corp., Eastman Kodak Co., General Motors, Staples, the New York State Department of Environmental Conservation, the U.S. Department of Defense and the U.S. Department of Transportation. The institute also has longstanding relationships with many other companies, assisting in promoting the use of environmentally benign manufacturing, which has reduced waste and energy use while also increasing productivity and efficiency. The grant is a component of the NIST Construction Grant Program and RIT was selected after an extensive competitive search. Only five projects were selected out of 124 proposals received. RIT has also received $10 million in funding from the state of New York to assist with construction, and New York’s U.S. Senate delegation and Rochester’s congressional delegation have secured substantial funding for the institute’s applied research and technology transfer programs in life-cycle engineering, fuel-cell technology and other focus areas. In addition, the Golisano Institute has received significant corporate and foundation investments toward its education and research programming as well as its laboratory facilities, including $2 million from Xerox and $1 million from Eastman Kodak. RIT expects to break ground on the new facility in spring 2011. The new building will be designed to meet Leadership in Energy and Environmental Design standards set by the U.S. Green Building Council, which sets goals for waste and energy minimization and reuse in building construction and operation. The campus already features one LEED Platinum and one LEED Gold facility. The Golisano Institute for Sustainability builds on over two decades of research and education programming in environmentally benign design, sustainable production and recycling and remanufacturing process improvement conducted at RIT. “It is imperative that we accelerate strategies to promote a sustainable society and ensure future generations the opportunity to address their own needs,” explains Golisano. “For that reason, it is my desire for the Golisano Institute for Sustainability to produce the first generation of professionals with the vision and know-how to deliver on the promise of sustainability, and I am very proud to be associated with this exciting endeavor.